Summer break felt like it really kicked in this past weekend when my girlfriend Wendy Kemp and I drove to southwest Oklahoma to enjoy the Wichita Mountains. After visiting my parents in Oklahoma City, we drove southwest to Medicine Park on the eastern edge of the Wichita Mountains Wildlife Refuge and walked along Medicine Creek. 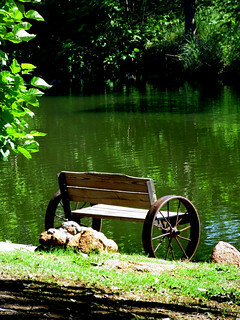 The park benches there look like they could roll off into the water, but that didn’t stop Wendy from enjoying one. We reached The Sentinel, a metal buffalo, and crossed the creek on the Curtis Davis Bridge. We had no trouble heeding the profanity ban amidst the squealing children at the Bath Lake. 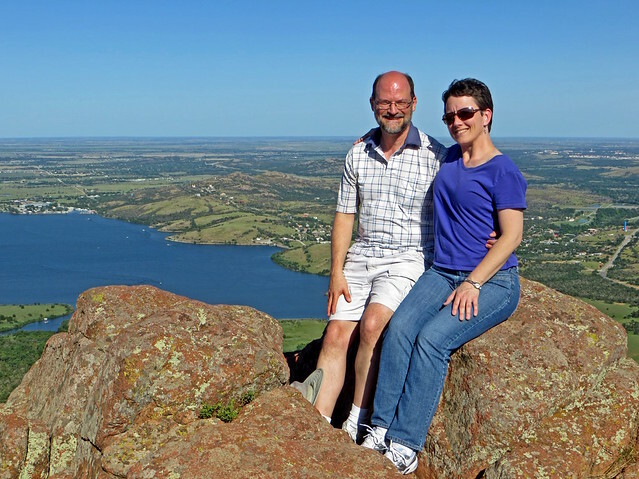 We then drove up Mount Scott, where Wendy captured me against the backdrop of the Wichita Mountains to the west, and she posed by the pretty wildflowers scattered across the mountaintop and high above Lake Elmer Thomas, and a friendly couple snapped a photo of us. We then drove over to Quanah Park Lake to enjoy the views from its dam. A crazy guy taking a dip on the opposite shore yelled out profanities as he rambled on and on to himself. He wouldn’t have been welcome at Medicine Park, but Wendy and I found him rather entertaining. The final stop in the refuge was at the Sunset Area, where Wendy spotted a rattlesnake slithering across the road and into the grass. I made a video of its progress. We wrapped up our day at the famous Meers Restaurant where we split one of their huge burgers, and Wendy had what she described as the best peach cobbler ever. On our way to the parking lot we passed a funny meowing MeersKat, not a meerkat, stretched out atop a sign. We then drove west to Quartz Mountain Resort, which would be our base camp for a couple of days.